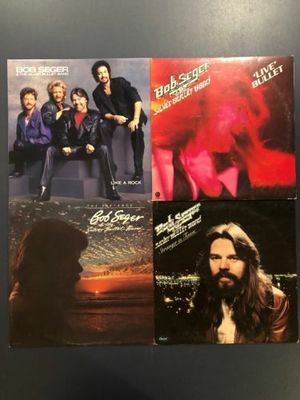 Gripsweat - BOB SEGER Lot of 4 Vinyl LP Like Rock Stranger Town Against Wind Live Bullet ..
BOB SEGER Lot of 4 Vinyl LP Like Rock Stranger Town Against Wind Live Bullet ..
All of the grading is done by visual inspection. I pack each record with care and attention to detail to ensure safe shipping and handling. All records are shipped outside of the jackets to prevent seam splits unless they are sealed. Please remember that your listening experience will vary tremendously if you use a top notch player versus a budget player. Also all records should be cleaned prior to use. Some records may in need of a good bath! Some records may not have sleeves. I will ship these in a new sleeve. I want for you to be happy with your purchase so if you have any questions or concerns please feel free to send me a message BEFORE bidding/purchasing. As I ship media mail your purchase is not insured. I use industry standard methods to ship. Should you desire insurance please wait to pay and ask to upgrade to priority mail. Generally this changes the shipping from $4.99 to about $10 If shipping is not upgraded and your item arrives damaged please open a case with eBay and list USPS at fault. Thanks! NEAR MINT (NM) ~ Looks as if it just came from a store and was opened for the first time. Possibly played a few times if ever, with little evidence of play/wear. Overall in “like new” condition. May have a few small visible flaws that do not affect play. Excellent (EX) ~ These records will show faint signs of wear such as light scratches/blemishes/scuffs. However the marks are superficial for the most part should not affect the quality of the sound too much. A Excellent record will play with little surface noise (if any) and will have a great listening experience. Jacket may have 2-3 of the following: light ring wear, wear on the corners/ seams, small names, stickers, notch/ corner cuts, creases, and light discoloration. Labels may have spindle marks, small writing such as initials, and small stickers. VERY GOOD PLUS (VG+) ~ Shows signs of wear, light scuffs or scratches may be present but they should not affect playback significantly. Nothing felt by fingernail. Jacket may have a 3-4 of the following: ring wear, shelf wear, seam splits (less than 1” long), writing, creases, discoloration, names, stickers, notch/corner cuts . VERY GOOD (VG) ~ These records show more obvious signs of wear and handling. Record has surface noise that is noticeable in some spots but perhaps is quiet and clean in other spots. Clicks and pops may be heard, especially during a song’s intro/outro. Some of the scratches can be felt with a fingernail. The jacket can have more pronounced ring wear, shelf wear, stickers, marks, staining, seam splits on any or all 3 sides but they are still fairly intact, writing, cuts, and discoloration. GOOD PLUS (G+) ~ Significant and obvious wear and handling including surface noise throughout, audible scratches which cause clicks and pops and crackle but no skips or repeated grooves. Jacket may have significant ringwear and/or staining, seam splits and all 3 sides, cuts/rips/tears. shelf wear, stickers, and discoloration. Jacket may have writing, names, stickers, be partially peeled off, and can have numerous spindle issues. Please note that the shipping discount Maximum applies up to 20 albums. THUNDER 29 Minutes Later 6 Track 12" Vinyl! Record Store Day 2017 Release! New!